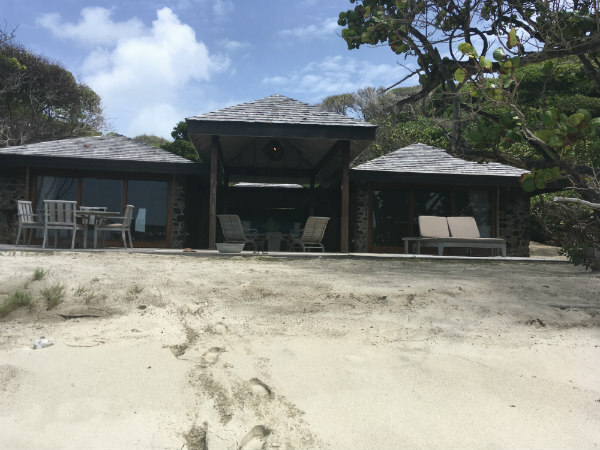 Jo visited Bequia in May 2018, staying at Bequia Beach Hotel and Bequia Plantation Hotel. Click here to read all about her trip. 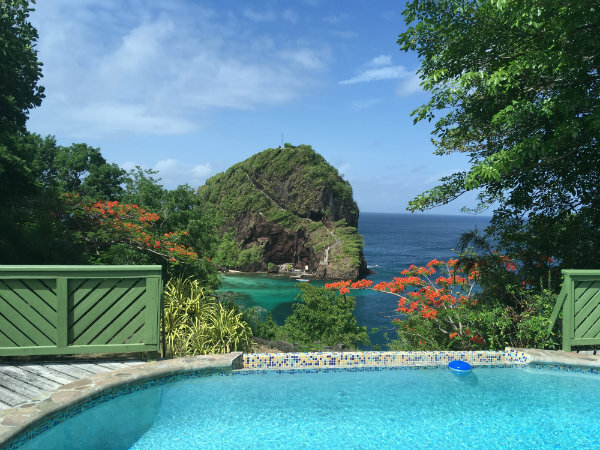 Marketing Manager Rachel set off on an island hopping journey through St Vincent and the Grenadines in 2017 courtesy of the nation’s tourist board. She travelled southwards through the islands, visiting Young Island (just off the coast of St Vincent), Bequia, Mustique, Canouan, Petit St Vincent and finally Palm Island. "My trip began with a flight from London Gatwick to Barbados with Virgin Atlantic then an evening flight on to St Vincent with Liat. We arrived in the dark and travelled about 20 minutes by car then crossed by boat to our first destination, Young Island. 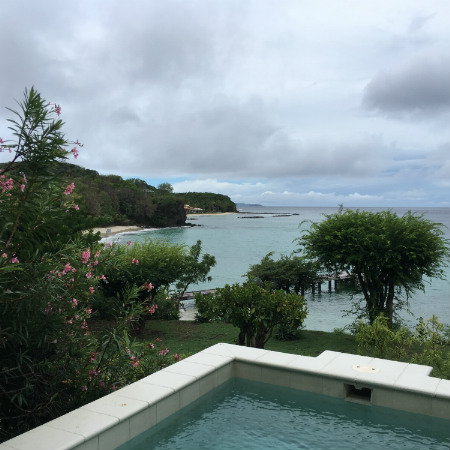 I was staying in the hilltop Duvernette Suite for two nights, a two bedroom suite with a kitchenette, extensive indoor and outdoor seating areas and a large garden with terraces and a private plunge pool overlooking a small island. We started our first full day in the Caribbean with breakfast followed by a tour of the island. Young Island is known for the selection of bread that is baked on a daily basis, so I made sure to try some – French toast made with coconut bread was delicious! I then saw a selection of other cottages on the beach level and further up the hill, some allowing guests to walk straight out onto the sand and others offering lovely views from the elevated setting. Accommodation is rustic yet charming with typically Caribbean furnishings, shuttered windows to make the most of the sea breezes, private terraces with sun loungers, and some boasting private plunge pools. The island itself is incredibly lush and green, with a swimming pool and tennis courts hidden away amid the vegetation and accessed by pretty pathways. The bar area and outdoor dining gazebos of the restaurant are found by the beach, where guests can also relax or enjoy fantastic snorkelling just a short distance from the shore. 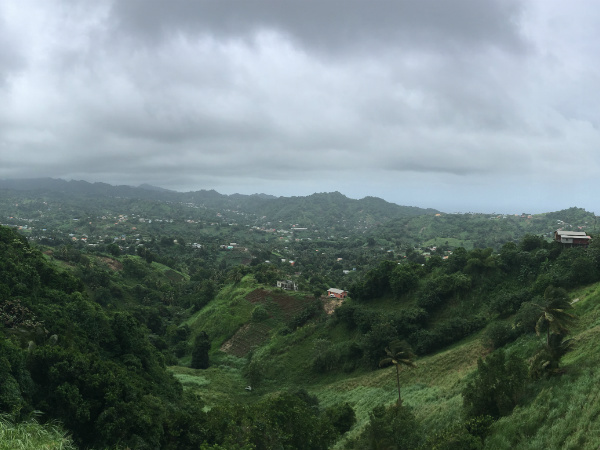 That afternoon we set off on a brief tour of St Vincent, driving along steep and windy roads towards Belmont Lookout where there are panoramic views over verdant hillsides – spectacular even on a cloudy day. After lunch at a restaurant in a busy marina, we boarded a speedboat for a trip along the west coast of St Vincent. We passed rugged cliffs and black sand beaches lined by palm trees, heading towards Walliabou Bay, one of the locations used in the filming of the Pirates of the Caribbean movies – highly recommended for the stunning scenery! Back on Young Island, we ate dinner in one of the restaurant’s open air gazebos. The food was simple yet tasty and the setting was charming, with atmospheric lighting and the sound of the waves in the background." "The following morning we caught the ferry from Kingstown (St Vincent’s capical) to Bequia, arriving in picturesque Port Elizabeth one hour later. 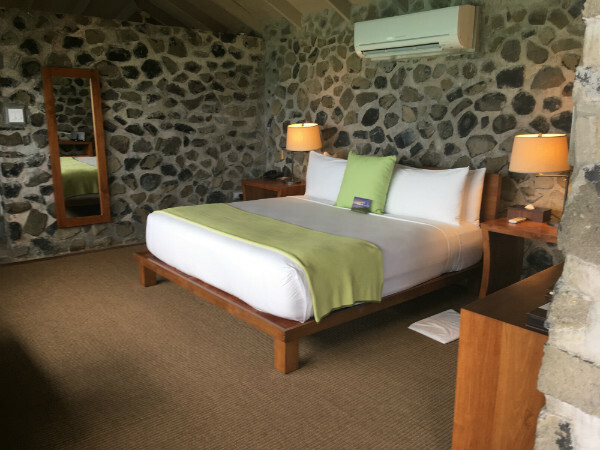 We drove to Bequia Beach Hotel, a delightful property with extensive gardens and a modern colonial style which combines with 1950s influences. My first floor Beachfront Suite was luxurious and extremely comfortable, offering wonderful views over the beach and out to sea. Other room types are set further back from the beach, some in cottages in the gardens and others set up the hillside with views over the resort. 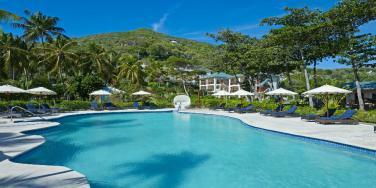 The terrace surrounding the main swimming pool is a lovely place in which to relax just a few metres from the beach, while the second hillside infinity pool offers views over the resort. 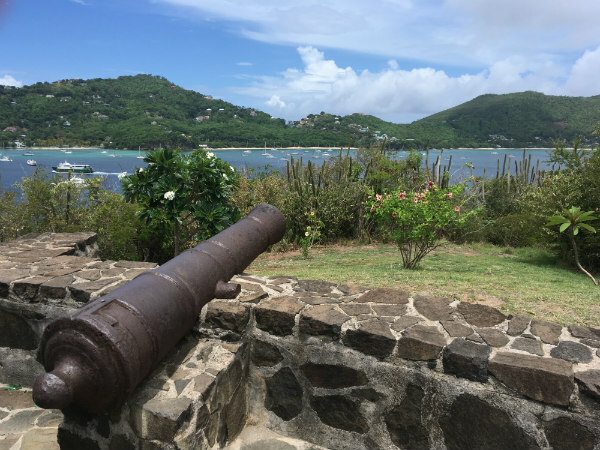 We set off on a short tour of Bequia, which I found to be a charming island with bays filled with yachts, colourful houses, pretty little cafes and friendly locals. First we headed to Fort Hamilton to enjoy the panoramic views over Admiralty Bay and Port Elizabeth, then we enjoyed a scenic drive to the north east coast of the island to visit the Old Hegg Turtle Sanctuary. 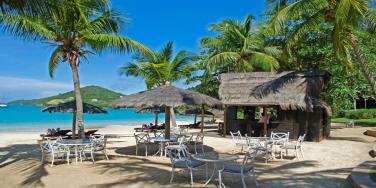 We ate lunch at Jack’s Beach Bar, a chic yet laidback restaurant which is owned by Bequia Beach Hotel. 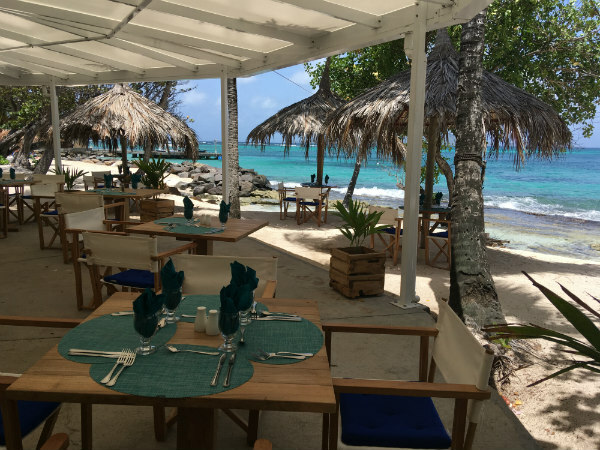 Located on the pristine sands of Princess Margaret Beach, the setting is spectacular and the food is exceptional – the fried chicken was delicious and the tuna nicoise salad comes highly recommended! 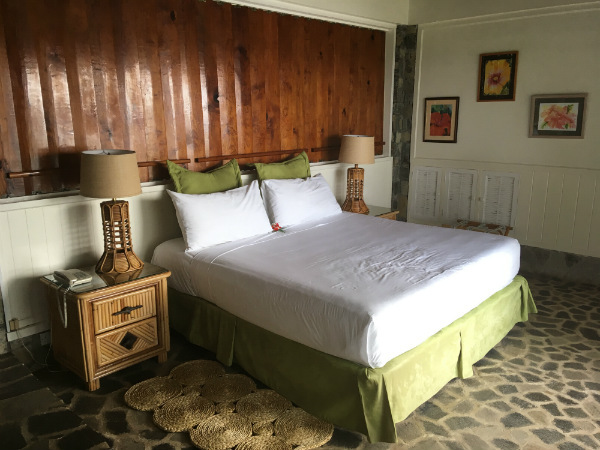 After lunch we walked around the coast to visit Bequia Plantation Hotel, a well located property with large beachfront grounds and gingerbread-style cottages housing contemporary and spacious guestrooms. 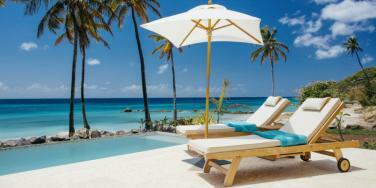 Back at Bequia Beach Hotel, I spent a few hours relaxing by the pool and enjoying the views from my luxurious suite. 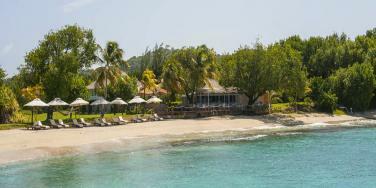 Dinner that evening was at the beachside Bagatelle Restaurant, where live music played over the sound of the waves. We enjoyed an excellent Caribbean barbeque buffet which was a great opportunity to sample local dishes such as delicious goat curry." 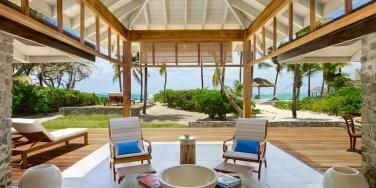 "We left Bequia the following morning and boarded a flight to Mustique with a journey time of just 5 minutes. On arrival, we climbed into a mule (one of the most common modes of transport on the island) and drove just a few minutes to the Cotton House. I loved the relaxing ambiance of the elegantly furnished Great Room and Veranda Restaurant, and was surprised to see how vast the hotel’s fragrant grounds are. Each of the hotel’s rooms, suites and cottages are beautifully decorated, with a pale colour scheme complemented by colourful yet sophisticated soft furnishings. 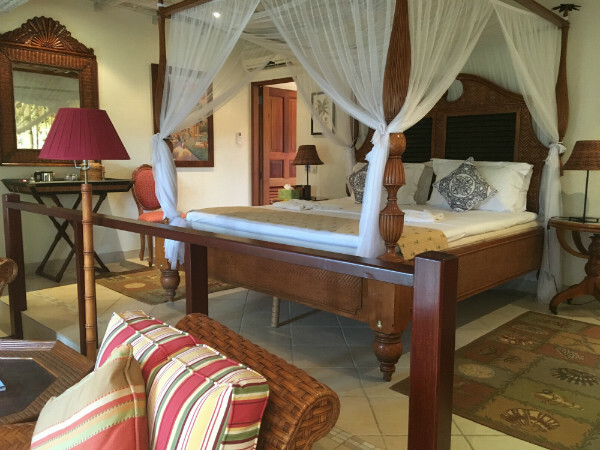 I loved all the accommodation options – from garden cottages occupying pastel coloured buildings, to garden suites with private plunge pools and sea view rooms overlooking a gorgeous stretch of beach. Facilities are spread out to make the most of the space, with the swimming pool, tennis court, spa and beach café all occupying their own secluded area. After exploring The Cotton House, we drove across the picturesque island to visit one of the many villas that are hidden away in the hills. Guests staying at the hotel are encouraged to hire a mule during their stay so that they can explore the tropical surroundings, with plenty of palm fringed beaches to discover. We were lucky enough to visit Les Jolies Eaux, the villa once owned by Princess Margaret. This amazing property is set on a promontory, offering luxurious accommodation with panoramic views over the coastline and nearby islands – an extremely special place with a great history! 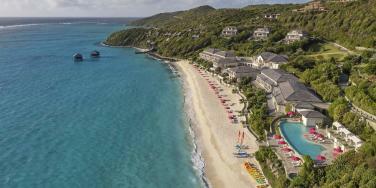 We then flew on to Canouan, arriving within 10 minutes. Here we were spending the night at the recently opened, ultra-luxurious Pink Sands Club which is set on an impressive stretch of beach on the Atlantic side of the island. There is a pink theme throughout the 26 huge suites, each of which is sumptuously furnished and boasts the latest technology including ipads to control the lights, curtains and air conditioning. My ground floor suite allowed me to wander through a small private garden onto the beach, while the first floor suites offer spectacular views over the white sand and turquoise sea. All bars and restaurants are furnished to the same high standards, while the exquisite spa boasts overwater treatment rooms. Although the main hotel is quite compact, the rest of the estate is vast so all suites and villas have the use of a golf cart to get around – just make sure you watch out for the many tortoises that roam freely across the island! 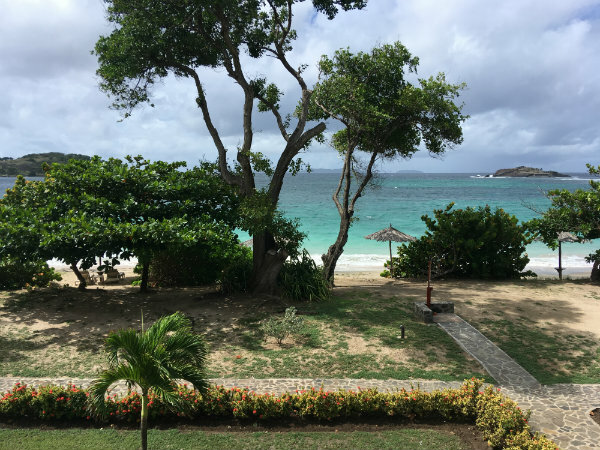 The kids club is outstanding, while the 18 hole golf course (the only one in the Grenadines) offers breathtaking views over Canouan and nearby islands. Lunch at the Pool Bar and dinner at Juliet Restaurant were both delicious, with a five course evening menu featuring inventive and extremely tasty cuisine." "Breakfast at Pink Sands was equally as good as all the other food, served on a terrace outside the ground floor Lagoon Café. 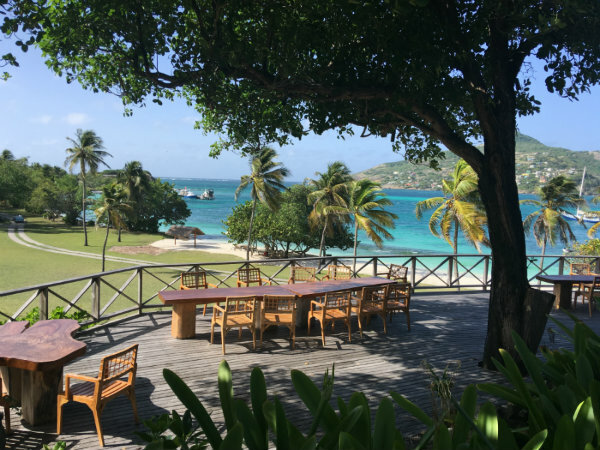 Our last stop on Canouan was the Tamarind Beach Hotel & Yacht Club, a boutique hotel on the Caribbean side of the island with a peaceful atmosphere. All rooms and suites overlook the calm seas and feature dark wood and rattan furniture, some with direct access to the wide, sandy beach. There are two restaurants and a beach bar, plus a unique delicatessen which sells cured meats and products imported from Italy. We then boarded a 5 minute flight from Canouan to Union Island, followed by a short ride by speedboat to Petit St Vincent. On arrival, I was immediately stunned by the island’s beauty – lush foliage is almost entirely surrounded by white sand beaches and turquoise waters, with hardly a building in site. I was staying in a two bedroom cottage on the Atlantic side of the island, where I could walk straight onto a stretch of beach which looked wild and untouched. 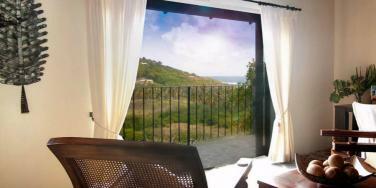 Two en suite bedrooms were connected by an open air dining and living area, with sun loungers and a shady hammock by the beach. Just 22 cottages are dotted across the island, some on the beach and others on the hillside overlooking the coast or further inland – cottages offer a unique design and view, but all share the same high quality furnishings. 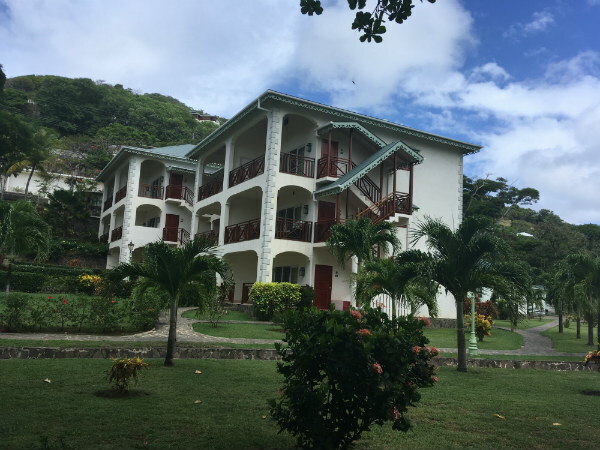 Petit St Vincent is known for its unique flag system which allows guests to request room service for breakfast, lunch and dinner – why would you need to leave your cottage?! 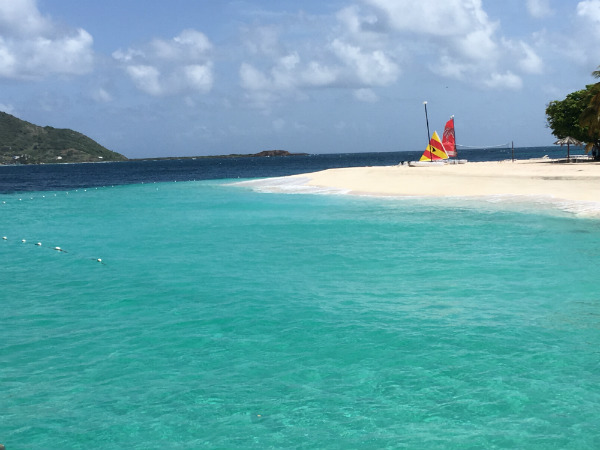 After lunch at the casual beach restaurant I spent the afternoon relaxing on the beach, paddle boarding in the calm Caribbean waters and sailing a hobie cat with a member of the friendly watersports team. I then visited the peaceful Hillside Spa and enjoyed a Balinese massage in one of the pretty treatment rooms which are are set high above the beach with just the relaxing sound of birdsong audible! 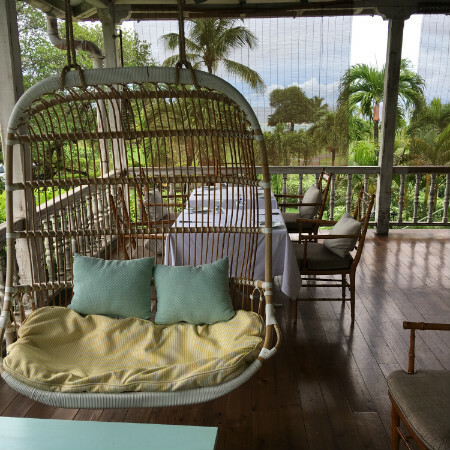 That evening we dined at the island’s main restaurant, an elegant venue with tables on a wooden deck lit by candlelight – the service, food and setting were all exquisite!" "The following morning, I went for a wander along the island’s beautiful western coastline, where shady hammocks and sun loungers are dotted alongside a gorgeous stretch of beach. With more room service menus available for guests to order food and drinks to their hammock, I wished I could stay and spend the day here! 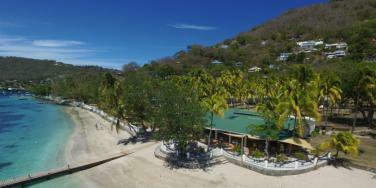 After breakfast at the main restaurant it was sadly time to leave Petit St Vincent and make the short trip by boat to Palm Island Resort & Spa, where the first thing I noticed was the breathtaking colour of the turquoise water against the bright white sand beach. I was staying in one of the Palm View Rooms, set back from the beach but with a spacious seating area and outdoor terrace. 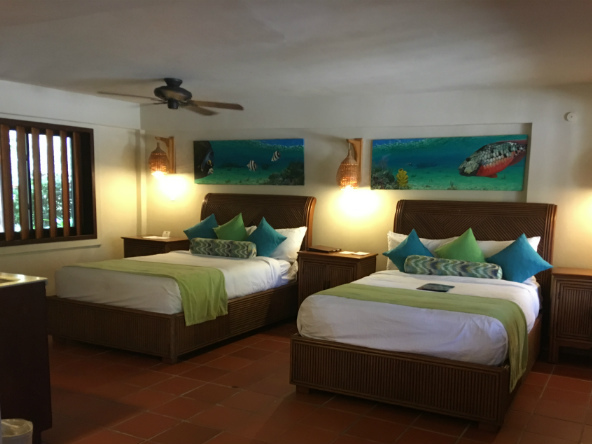 Most rooms are furnished in a simple Caribbean style, while the beachfront rooms are being refurbished to become more contemporary with whitewashed walls, pale wooden floors and pops of colour. We ate a casual lunch at the Sunset Restaurant, followed by a boat trip to the nearby Tobago Cays to go snorkelling with turtles. As well as snorkelling with hawksbill and green turtles in the crystal clear lagoon, I also snorkelled over the coral reef that protects the islands where I spotted an abundance of tropical fish as well as stingrays and eagle rays. On our return to Palm Island, I visited the resort’s new spa which is fresh and modern in style, set on a picture perfect stretch of sand. I enjoyed an excellent full body massage where the friendly masseuse used the spa’s own hibiscus flavoured products – simply divine! It was then time for dinner at the open air Palm Restaurant accompanied by live music, followed by a silent movie on the beach. A cinema screen was set up, sun loungers were lined up and guests were given a set of headphones to watch Pirates of the Caribbean – a superb choice considering the setting!" 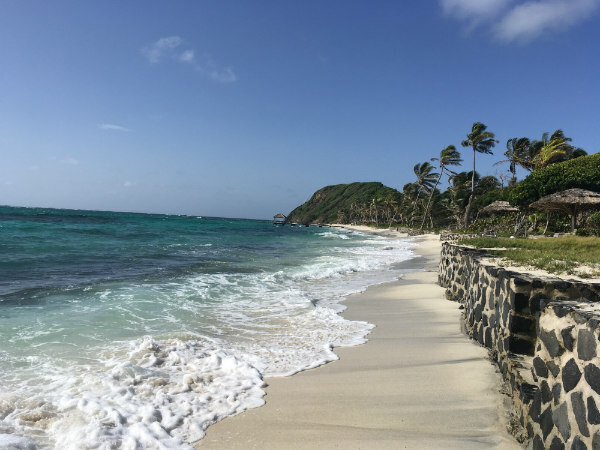 "On our final morning in the Caribbean, I ate breakfast in the Palm Restaurant (offering a great selection of buffet options plus excellent a la carte dishes) then took one of the resort’s bicycles to explore the island. The island is great for those who wish to feel close to nature, with iguanas wandering freely and a great array of birdlife, as well as a tortoise sanctuary which guests can visit. Although it takes just 5 minutes to cycle from one end of the island to the other, there is a great feeling of space so guests can easily find a secluded spot to relax in, with shady hammocks set up on some beaches. Climbing one of the small hills in the north of the island allowed me to enjoy remarkable views over the resort and out to sea, with brilliant white sand merging into vibrant turquoise water. It was then unfortunately time to leave Palm Island, taking a boat to nearby Union Island then flying to Barbados and back home to Gatwick. 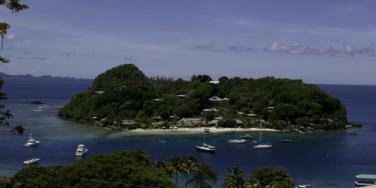 If only I could have stayed longer in the beautiful Grenadines!" 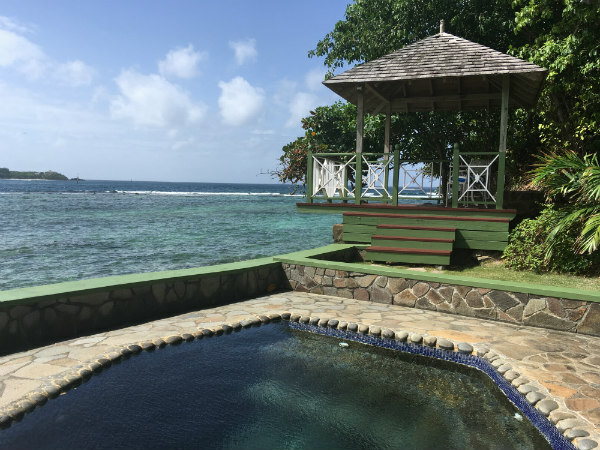 Many of the Tropic Breeze team have visited St Vincent and the Grenadines, so call us on 01752 880 880 to discuss your next holiday!